Our other Aperture products, however, remain incompatible with Mojave. As a result, we've removed them from the Mac App store. They still remains available for purchase directly from us. Please keep in mind that we are not currently supporting any Mojave users for those products. Your library needs to go on a diet! Convert RAW images files into JPEGs directly in iPhoto and save space. Love to shoot RAW? Certainly it's the way to get the best out of your camera. The downside is that the files are BIG. Why keep those large master files around if the picture itself isn't amongst your best? If your Library is bloated with RAW files you don’t necessarily need but can’t bring yourself to throw away, RawHide is the compromise you’ve been looking for. RawHide is designed to convert the RAW files you select into high quality JPEG files while preserving your metadata such as comments, ratings, and locations. RawHide will then tag or move the original to iPhoto's trash. 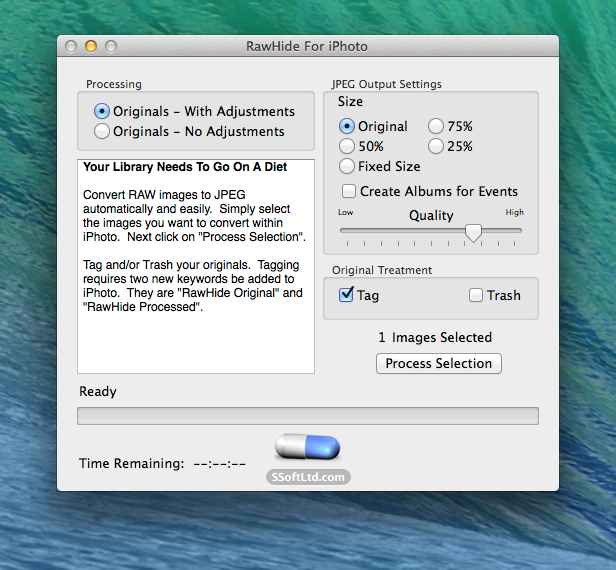 RawHide will also process your Photoshop and TIFF images. 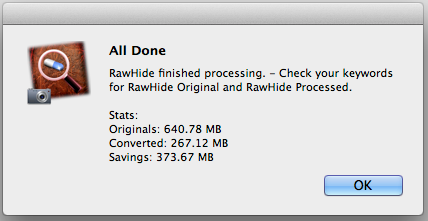 In fact, any image format iPhoto can handle will receive the same treatment by RawHide. √ Free up valuable space on your drives. Savings may be upwards of 80%. A library of RAW files taking upwards of 1GB would be reduced to around 200MB of high quality original size JPEGs. √ RawHide your adjusted RAW images or discard the changes and archive the original version. √ Scale the image down from the original size to save even more space. √ Adjust the new images compression setting between very high to almost no compression. √ Tag or Delete the original. √ A large range of image formats supported. The demo version allows you to convert as many images as you want in any quality using any settings. Each converted image will be visibly watermarked. Purchase it from the Mac App Store or here and name your own price to remove this restriction. OS X Lion (10.7.x) or better. Visit the Rawhide For iPhoto Support Page. V1.3.6.1 Improves the quaility of generated JPEGs at every quality setting. This can result in larger JPEG file sizes at your previously choosen setting, so you might want to re-verify if the setting is still appropriate for you. Improved file size statistics. Removes demo mode restrictions on which iPhoto versions can be used. V1.3.4 Bug fixes, including a fix for retina equipped Macs where RawHide could generate 2X resolution JPEGs. V1.3.1 New conversion mode to fixed width/length. Prevents machine from sleeping while conversion is taking place. Time Remaining estimates. Other minor improvements. This version *might* also work on OS X 10.6 machines, although we are unable to test it. If you try it out and it works or not, please drop us an email. V1.2.3 Bug fixes, including a fix for an issue that caused location data to be corrupted in the converted JPEG. V1.2.1 Bug fixes for Place in Albums feature. V1.2 Ability to create albums for the converted images. Albums are named after the original's event. Basic help now available. Bug fix for case where an attempt is made to convert an image whose file is missing but still being tracked by iPhoto - A SaD For iPhoto situation indeed. Radio buttons instead of check boxes because it is so important [sic]. V1.1.3 Automatic updates are now included along with the ability to apply a purchased license file to make the demo fully functional. A few minor UI tweaks applied to alert dialogs. Fixes UI layout issues for OSX Lion users. V1.1 Keywords are now automatically generated. You no longer have to enter them manually. V1.0.2 Bug fix to address case where certain metadata from an original was not included in the converted JPEG image. By purchasing direct from us you will receive a license key which unlocks the demo version of the application. All prices are quoted in CAD dollars. Copyright © 2019, Blue Pill Software Store. Hosted, managed, and operated by Blue Pill Software Ltd.